The critical work we do in our local Brown County Community depends heavily on the generosity and shared vision of our supporters. With JOSHUA being a nonprofit organization (501c3) our budget is made up through member and partner congregations, donations from individuals (just like you), fundraising, and grants from foundations. Please consider helping JOSHUA in our continued efforts to keep “doin’ justice” with a fully tax-deductible gift. Click here to learn how to make a donation to JOSHUA. Click here to learn about our AMAZON Smile Account, to donate to JOSHUA while you shop on amazon! Click here to learn about our sponsors. We are very excited to announce that our 14th Annual JOSHUA Banquet will be on Friday, November 2nd at the Tundra Lodge Resort & Conference Center! Please make sure you add this to you calendar, and stay tuned for more details! Every year we have a team come together to plan the annual JOSHUA banquet; but this year we're going to do things a bit differently. We are going to form smaller committees to really focus on one aspect of the banquet to make the whole banquet stronger than ever before. I ask you think about if there is one or two areas that you can really bring your strengths. By dividing up the work; it will make the work easier for everyone, as well as require less meetings for all! Please take a minute to consider where your talents can be used to help strengthen JOSHUA and the 2018 14th Annual JOSHUA Banquet. Click here to fill out the form. Are you or someone you know looking for an internship? Interns will learn more about the operations of nonprofit organizations and will work closely with experienced professional staff. Intern(s) will gain skills in organizing, fundraising, public policy, and advocacy. Reporting to the Community Organizer, the Program Intern(s) will work to pass and defend top issues by: 1) engaging citizens on mental health, prison reform, and environmental justice issue campaigns, 2) generating and tracking media coverage; 3) recruiting a new generation of members to our social networking sites; 4) encouraging on-line supporters to take action and volunteer 5) updating media contacts; and 6) assisting with issue research. Organized with strong written and verbal communication skills. Ability to conduct research on-line or through traditional media. Database management experience and event planning skills a plus. Independently motivated and enjoy working with people. Interns will work from the Green Bay office of JOSHUA, located at 130 St Matthew Street, Green Bay WI 54301. Interns can arrange to work remotely. Interns may earn 2-4 course credits (typically, students earn 1 credit for every 3-4 hours worked per week). The position is unpaid. Internships not for class credit also available upon request. Interns are responsible for finding a faculty sponsor and meeting all internship requirements of the college or university. Please send a letter of interest and resume to Rachel Westenberg at rachel.wisdomwi@gmail.com Call 920-360-3538 with any questions. Positions are Limited. Early Applications will be given preference. To acknowledge Mental Health Awareness month, our May monthly meeting will be a QPR (Question, Persuade, Refer) training provided by Korina Aghmar from Brown County Health Department. Learn the warning signs of suicide and how to help someone in need. 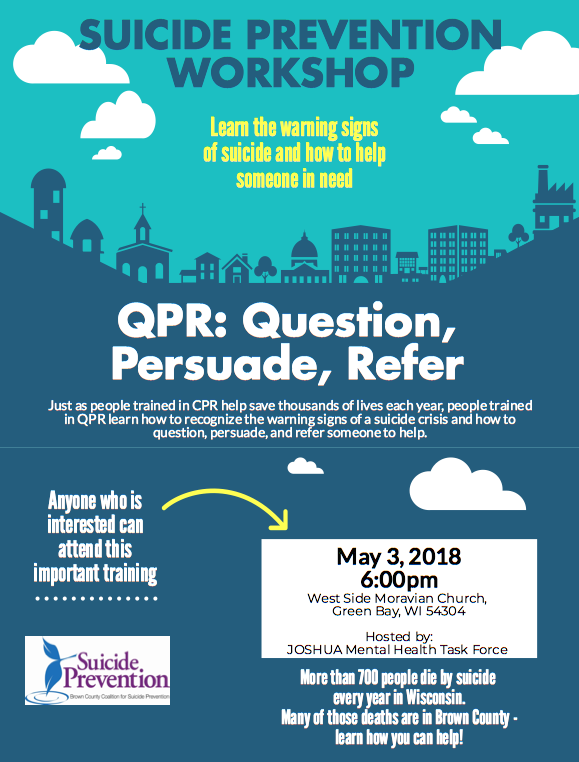 Just as people are trained in CPR help save thousands of lives each year, people trained in QPR learn how to recognize the warning signs of a suicide crisis and how to questions, persuade, and refer to help someone. More than 700 people die by suicide every year in Wisconsin. Many of those are in Brown County - learn how you can help! **Please note the change in time from our usual starting time.